Traditionally there has been a clear distinction between curriculum based and problem based approaches to accomplish learning. Preferred approaches depend of course on conviction, culture, traditions and also on the specific learning situation. We will argue that it is not a question of either/or but rather both/and. In this paper we describe an approach to design and delivery of online courses in computer science which on the one hand is based on a specified curriculum and on the other hand gives room for different learning strategies, problem based learning being one of them. We discuss the challenges in applying problem based learning strategies in a context where several universities, with different cultures of teaching, collaboratively develop and deliver online courses. We present a pedagogical framework embracing both problem based and curriculum based strategies and show how we used this as a basis for trying out various online learning strategies. Curriculum and problem based strategies for accomplishing learning is often described in opposition to one another (e.g. Kirschner et al. 2006). Curriculum based strategies, normally designated as teaching, aim at providing the student with a relatively fixed amount of agreed upon knowledge within a domain. Focus is on content, teacher control and instruction. Problem based strategies, normally designated as learning, on the other hand is more aiming at providing the student with abilities to acquire knowledge appropriate to solve problems within the domain. Focus is on learner experience, participant control, learner self-management and guidance. The two strategies here mentioned must of course be seen as an expression of a rather gross simplification, covering many variations in the conception of learning and the use of technology in the learning process. We use it as a way of referring to two different paradigms for using technology in online learning (Barr & Tagg, 1995). One is the “traditional” approach covered by the Instructional Design tradition focusing on transfer of knowledge and teacher controlled organization of the learning process. The other, being a social–constructivist approach, is formulated almost in opposition to the traditional approach of using technology in learning and is characterized by focusing on providing conditions for the students’ construction of knowledge, working with authentic task, and in collaboration with others (e.g Jonnassen, 1994). In this paper we describe a pragmatic approach to design of online courses in computer science which on one hand is based on a specified curriculum and on the other hand gives room for different teaching strategies including problem based learning. In what follows we describe the Mediterranean Virtual University project in which the design approach were developed and used and our own role herein as responsible for providing project participants with knowledge on learning design and e-tutoring. We explain the design approach and the overall pedagogical model chosen. We present a model of problem based learning, which were our own point of departure, and discuss the challenges involved in applying this in the project. Finally we introduce a broader framework for strategies to accomplish learning and explain how this framework was used to present, test and discuss various aspect of activity based learning. The Mediterranean Virtual University project (henceforth MVU) was a collaborative venture between institution in the Mediterranean region, the University of Strathclyde in Scotland and Aalborg University in Denmark building a network to collaboratively develop and deliver online courses within the domain of computer science. Thus the aim of the project was to develop and deliver courses which could meet the requirements of industry and individuals, to explore opportunities and advantages afforded by e-learning, and to build capacity among the participating partners in ways that could be cascaded locally and sustained. The project was funded by the EU EUMEDIS1, had duration of two years (2004-2006) and was led by the University of Strathclyde. The project resulted in the development of 40 undergraduate level courses in computer science. Each of the courses was rated at 5 European Credit Transfer Point2 and together they cover all levels of the undergraduate curriculum. Almost half of the courses were delivered in a pilot version to students, mostly to already existing groups of students as part of credit bearing programs. Furthermore the project resulted in a concrete basis for the partners involved for development and use of e-learning both collaboratively and individually. Our role, as participating in the project from e-learning lab at Aalborg University, was to train participant in learning design and to specify pedagogical models for effective delivery of online courses. The training was delivered by two sets of activities, one for course developers and subject specialist providing them with knowledge on pedagogy and e-learning and another for tutors providing them with knowledge and experience in online teaching strategies (Buus et al 2006, Bygholm et al. 2006). In the beginning of the project some fundamental decisions were made to structure and guide the development and delivery of courses. First it was decided to base the development on the recommendation of the Computing Curricula 2001 project (CC2001) - a joint undertaking of the Computer Society of the Institute for Electrical and Electronic Engineers (IEEE-CS) and the Association for Computing Machinery (ACM)3. These recommendations were recognized as the authoritative statement of the educational goals and requirements in the area of computer science and all the partner institution had already been mapped to this standard. The ACM2001 description of computer science curricula made it possible to develop a coherent set of course with a specified relations to one another and no overlaps, making explicit what kind of knowledge were involved in e.g. “object oriented programming” or “databases”. It provided a common language and framework for expressing the course design. Second it was decided to base the development of courses on the concept of learning activities comprised of learning objects based on the general assumption that people learn better when actively involved in doing something. This learning approach ensue from an understanding of learning based on the idea that knowledge is actively constructed by the learner, not passively received from the teacher. Furthermore the basic understanding of learning in the MVU project involved the assumption that learning is both a social and a situated process, meaning that emphasis should be put on dialog, group work and situated activities. Third it was decided to use Moodle4 as learning management system (LMS). Moodle was chosen in the beginning as a platform for our training activities with the partners. As open source software Moodle was free to all partners to install, which almost all partners have done during the process of development. Moodle was considered to be very user-friendly by developers and tutors and the common platform also facilitated the interoperability of courses across the consortium. To guide the design of courses the MVU course design approach was developed and expressed in two diagrams (Everett 2004). A course was based on several modules, and each module was divided into several activities. The activities should respond to learning objectives (as specified in the ACM2001 curriculum). An activity were comprised, as illustrated in figure 2, of different learning objects e.g. a test or explanation to read, live video conference, group work, research, or self-tests like quizzes etc. Furthermore an assessment was attached to each activity. Also of importance for course design approach was the wish to share smaller elements of courses among the partners. 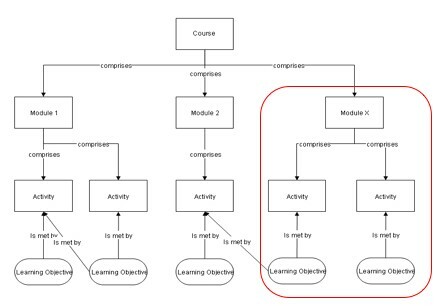 Thus in order to pursue portability and reusability it was decided that design of Learning Objects should be compliant to the learning standard of “Shareable Content Object Reference Model” (SCORM), making it possible to adopt small elements of course material from one course module into other course modules. Using SCORM as the standard for learning objects meant a standard for how content may be packaged into transferable files5, and a possibility to be reused in other modules in a course. The course design approach provided a framework and in a broad sense ensured a common approach, based on activities, to design and develop courses. There were room for flexibility which e.g. allowed for use of different technologies and techniques in the development of courses, for different ways of organizing the development process and also for different interpretation of the activity based pedagogical approach. Problem based learning was introduced and discussed with the partners, both course developers and tutors, as a way of realizing the meaning of an activity based learning approach. Problem-Based Learning (PBL) has gained a lot of interest since it was launched in established educational settings over 30 years ago in the medical programmes at McMaster University, Canada. Essentially it is a leaning methods based on the principle of using problems as a starting point for learning and it is now used in multiple disciplines. There is many descriptions and definition of PBL but according to the editorial in the first issue of the Interdisciplinary Journal of Problem Based Learning (launched in 2006) their commonalities define it essence: At its core, a problem-based approach is designed to help students achieve two goals: (1) to acquire a deep understanding of specific content knowledge, and (2) to develop problem-solving and higher-order thinking skills (Ertmer, P.A. & Macklin A.S., 2006). At Aalborg University we work with Problem Based Learning in a special form designated “The Aalborg PBL model” (Kolmos et al 2004). This model has it historical roots in critical theory and, in particular, in the work of the German philosopher and sociologist Oskar Negt. Negt’s work in the area of learning is linked to his proposal of a renewal of the education program in the trade union, but also connected to the more general concepts of experimental learning and self-regulation (Negt 1971). Negt’s work gained a lot of interest in Denmark and the Problem oriented project based learning was developed under this inspiration. It was implemented as a framework for learning when Aalborg University was established in the beginning of the 1970’s. The study form has also proved to work well, offering high rates of accomplishment at a satisfying level of qualification both in psychical and online setting (Kjærdam et al, 1994, Kolmos et al, 2004, Dirckinck-Holmfeld 2002, Bygholm et al. 1998, Knudsen et al 2005). To use problems as a starting point for learning means, in the Aalborg model, that the crucial point in the learning process is the problem and not the curriculum. Thus content and focus of the study is not defined solely in terms of disciplinary knowledge but in terms of personal, social, and scientific problems. A problem is an anomaly; something that deviates from ordinary norms of behaviour; something unusual. Other main characteristic of our model is participant control, interdisciplinarity, and project organization. Participant control means that choosing the subject matter in important parts of the study is on the initiative of the students. Thus identifying the problem is a central part of the learning process. Interdisciplinarity means that insights from different scientific disciplines are integrated in the study of specific problems. Project organization means that the work with the problem is organized by a group of student in projects. The members of the group have to learn to work together, to make decisions collectively, to make a division of work, and to coordinate, etc. By making several projects, the students develop qualifications in connection with formulation, planning, management, and evaluation of projects. Besides, the students acquire a number of techniques and methods which are essential in connection with handling information and skills at processing and analyzing problems at different levels. This model of PBL has a risk of not providing the student with a sufficiently broad subject-area overview. In order to overcome this projects are conducted within the frame of a theme (in the study of computer science a theme is e.g. “development of software”, or “modelling”) and different kind of courses are offered both to support the project work and to provide the students with curriculum knowledge. 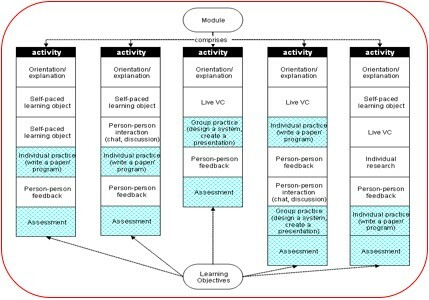 The organization of the learning process is illustrated in figure 3. A semester is lasting half a year (5 month approximately) the course work refers to 50 % and the project work to the last 50%. The student’s responsibilities of defining the problem contribute towards a high degree of ownership and engagement in the learning process. Thus this model of PBL is to be seen as a very learner active and collaborative pedagogy, which requires interdependency between participants in the learning situation, together with motivation, support and facilitation from the teachers (Ryberg 2006, Kolmos et al.2004). For several reasons it was not possible to fully apply the above described PBL model in the MVU project. First it was too big a step for the involved partners who were used to a more traditional university pedagogy building on lectures, distribution of information and teacher controlled organization of the learning process to switch to a problem oriented project based pedagogy where the determination of the content is guided by the problem not by the curriculum, and where the learning process is controlled by the student, based on collaboration and dialogue, and the role of the teacher is to act as a facilitator. The fact that the studies were to take place online gave problems in itself for several of the partners. Thus some of the involved institutions were rather sceptical of the whole idea of online education and hence also hesitating in the accreditation of the developed courses. During the project however most partners succeeded in getting the developed courses accredited at their own institution. 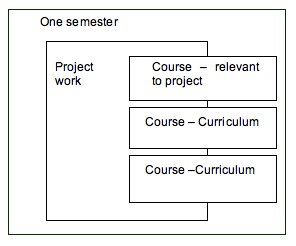 Second the commitment to the ACM2001 curriculum with its very specific descriptions of curriculum and objectives (which were practical in order to reach a coherent set of courses) contradicts the basic philosophy of the PBL model described above. The basic idea of a successful result of the learning process differs considerably. To success in PBL is to achieve the competences to solve problems within the area of, in this case computer science, independent of specific curriculum bites, whereas success of the learning process in a curriculum based approach implies a more specified qualification in certain methods and techniques. The reason for presenting and discussing in detail the PBL model with the partners were to provide them with a concrete understanding of what the application of activity based learning could mean. It turned out during the development of the courses that the activities specified by the partners were rather “passive” like e.g. “reading”, “make a presentation”, “do an analysis”, “make a report” and so forth. Although this is indeed activities we did not feel that it was in line with the commitment made in the beginning of the project that knowledge has to be actively constructed by the learner, situated in real settings and build in collaboration with others. Although it was not possible to fully implement the PBL model it played an important role in the project as a vehicle for getting attentions to issues involved in activity based learning and also as an outset for reflections on possible online strategies. Realizing that the PBL model was too radical in the context of the MVU project we introduced a broader model focusing on different ways of accomplishing learning. The intention of the model is to embrace the whole spectre from traditional teacher controlled curriculum based approaches to student controlled project based approaches. The model is derived from Richardson (2002) and modified under the inspiration of Goodyear (2001) and Ryberg et al (2006). Basically the model makes a distinction on the horizontal level between a content delivery focus and a focus on experience and practice and on the vertical level between guided navigation and learner self navigation. These distinctions give four qualitatively different ways of accomplishing learning, which are teaching (teacher controlled content delivery focus), studying (participant controlled content delivery focus), and exercises (teacher controlled experience and practice focus) and project (participant controlled experience and practice focus). The model was used in several ways during the project. First and foremost it was used in the Tutor Course to raise the awareness of and knowledge about different learning and teaching strategies in the organization of online courses. The tutor course introduced key concepts, methods, techniques and tools in teaching online courses. The course involved readings and assignment in parallel with actual testing and experimenting with teaching practice in running pilot modules. The overall issue during the Tutor Course was explaining, discussing and experimenting with different ways to carry out the activity based pedagogical methodology. Thus, techniques for communication, possible resources and assessment techniques were introduced along with main issues in organizing online learning e.g. tutor role, student motivation and teamwork. We attached importance to discuss examples on instructional strategies and explore the possibilities of staging activity based learning under each quadrant in the model. 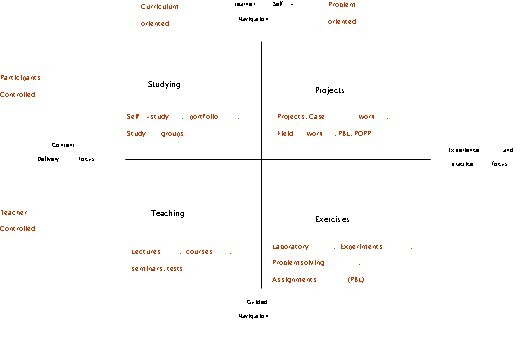 Actually a few of the participant adopted the problem oriented quadrant specifying activities as e.g. “Evaluate an existing interactive system with human-centred criteria and a usability test” (in the HCI course) The model provided a framework for gaining knowledge, for discussions and reflections, for experiments and for sharing ideas and experience. Secondly we used the model as a guide in the preparation and organization of an online workshop (Buus et al. 2006). The intention of the online workshop was to provide examples of online instructional strategies on the one side and on the other side to give the participant concrete experiences with different strategies as learners. The virtual workshop was also organized to give the participants opportunity to generate experience in the use of different tools and techniques for communicating online in various forms of collaborations. In brief the workshop lasted for five days, had a synchronous session each day (e.g. a talk, a discussion, a presentation) and a small project requiring cooperation between participant from different universities and countries. The use of the model as a theoretical input in the tutor course and as an organizing principle in the virtual workshop led to many discussions on the concrete understanding of the meaning of participant controlled versus teacher controlled activities and the differences between a focus on content delivery versus a focus on experience and practice. Also the experiments with various tools for communications and collaborations (chat, Flash meeting, wiki, messenger, forums, skype) led to a considerably interest in especially synchronous communication and collaborations tools. Although the partners in the development and delivery of courses preferred the teacher controlled quadrants in the model they adopted strategies for adding communication and collaboration among the students. And as mentioned the use of synchronous communication between students, student and teachers, and students and other external actors in the area, e.g. representatives from companies became highly used. All in all the broader model provided a solid foundation for explicating differences in main pedagogical strategies, for discussion and reflections, and for informed choice of instructional strategies. In order to manage the gab between curriculum based and problem based learning in the MVU project we applied three main techniques. First the course design approach ensuring a coherent set of course but also leaving room for flexibility and allowing for use of different technologies and techniques in the development of the courses, for different ways of organizing the development process and also for different interpretation of the activity based approach. Second The PBL model functioned as a vehicle for raising awareness on activity based learning and although the model was considered as too radical it fostered many discussions on possible pedagogical strategies. Third the model of multiple learning strategies were used both as frame for discussions and reflections, for informed choice of instructional strategies, and also as a concrete platform for testing various instructional strategies. The project did not succeed to implement radical changes in the pedagogical format among the partners, but the multiple learning strategy and the experimental approach in the online workshop practising PBL and ICT turned out to be very successful with respect to experiencing and explicating differences in main pedagogical strategies, and for discussions and reflections on the choice of pedagogical and instructional strategies. 1 EUMEDIS is a regional MEDA project for the development of the Euro-Mediterranean Information Society which aims at interconnecting through the Internet the Euro-Mediterranean research communities thanks to pilot projects in five priority sectors of intervention, one of them being information and communication technologies applied to education. Buus, L., Bygholm, A. and Walter, T. 2006, “Documentation of the three courses developed in Work Package 1 – “Training and Knowledge Exchange”. Course documentation report - the MVU Project, E-Learning Lab, Aalborg University. Everett, J., 2004, Course Quality Framework p. 3., Internal MVU document. Kirschner, P. A., Sweller, J. & Clark, R. E. 2006, “ Why Minimal Guidance During Instruction Does Not Work: An Analysis of the failure of Constructivist, Discovery, Problem-Based, Experiential, and Inquiry-Based Teaching”. Educational Psychologist, vol. 41, no. 2, pp. 75-86. MVU Technical Annex, approved by the Commission in 2004. Project funded by the European Community under the EUMEDIS initiative, strand 2. MVU Intermediate Technical Review Report, 2005, Deliverable D0.4 within the MVU-project. Project funded by the European Community under the EUMEDIS initiative, strand 2.